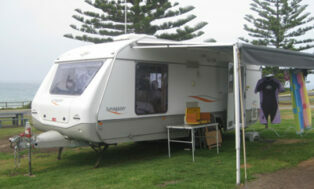 Jurgens Lunagazer Caravan for sale. Excellent condition. Modern lay out and décor, spacious and airy. Full ensuite across the rear with spacious, fully enclosed shower, toilet and washbasin. Large fridge, four burner stove. Light weight for safer towing and better fuel efficiency but with strong walls made of a combination of materials bonded together and vacuum pressed for strength. State of the art axle system for greater stability and control. Particularly suitable for first time caravanners. As we are finished our caravanning, (only because of age, 85) there are many extras to offer. Fully Australian made.